This is the third in a series of posts about author and anime scholar Marc Steinberg's personal collection of collectibles. See all posts here. Scholarship meets serendipity in the practice of collecting. What is there to collect? What is there to find? All this depends on a certain amount of contingency, serendipity, and of course, a sense of what to look for. Books on the subject and magazines of the time help a lot to learn what to look for. I for one relied a lot on toy trade journals of the 1950s and 1960s like Gangu shôhô to see what kinds of changes were to be found in the toys of the time. Then things move to the realm of chance. As I noted in the first entry of this series, my impulse to collect things Atomu-related was in part motivated by the need to prove or disprove the thesis that the Atomu TV series of the 1960s was what really kicked the media mix into full gear. But where to look? What things could be objects of inquiry? And how could objects themselves allow us to rethink media history? Omake or freebies like the stickers I wrote about in the last two posts were one group of things to look at. Children’s print culture and toys were two other places to look. They were two other archives of transformation that could potentially map the changes attendant to the Atomu boom of the 1960s. And they were also closely linked, much as chocolates and toys were. Children’s print culture has been a vibrant area and a key site for the development of character culture in Japan, going back to the 1920s. With the 1930s came the serialization of Norakuro, whose title character became one of the most popular characters of the 1930s (Figure 6, above), along with Disney’s Mickey Mouse. The Pacific War and the increased militarization of Japan over the course of the 1930s interrupted the development of character culture. It wasn’t until the 1950s that characters developed in earnest again. Once again it was in children’s monthly magazines that characters found their home. Magazines like Shônen and Shônen Gahô were incubators for the character culture that would really take off in the 1960s. I’ve heard them described as the R&D unit for the media mix – a perfectly accurate description. It was these magazines’ publishers that created many of the earliest character-based toys I’ve come across in the 1950s – toys like a “Cinecolt” light gun that shot images of characters like Atomu or Tetsujin 28-gô (Gigantor) on walls (Figure 7). These toys were offered as prizes for mail-in questionnaires, or for outright purchase. I can picture many a child hankering after one of these – pull the trigger and Atomu will shine onto your walls. It was also the magazine Shônen that included a “sono sheet” cardboard record player complete with the Atomu theme song as a furoku or magazine freebie (Figure 8). Sono sheets were a kind of low-tech, thin, and flexible record that could be played either on real record players, or on the cardboard ones that sometimes came as freebees with magazines. The only place I was able to come by the Atomu sono sheet and player is a treasure-trove of Atomu goods aptly called the “Tetsuwan Atomu: Happy Birthday Box” – a huge box released in 2003 on Atomu’s birthday (according to the manga, he was born in 2003). The Happy Birthday Box contains reprints of magazines, manga furoku of various sies, as well as re-issues of popular, Shônen-produced Atomu toys including the sono sheet player. Elsewhere I managed to find a Tetsujin 28-gô (Gigantor) sono sheet, released by Asahi Sonorama in 1964 and sold as a stand-alone object (Figure 9). This sono sheet appropriately came with an ad for Glico chocolates, Tetsujin’s sponsor, on the back of the album cover, a short illustrated story on the inside, along with the record sono sheet itself (Figures 10 and 11). Media synergy materialized. But if magazines were incubators for the media mix, it was in the realm of stand-alone toys proper that we’d find proof of the extent of the material transformations wrought by the release of television animation. Toys were also, not surprisingly, a lot harder to collect. Priced in the thousands of dollars, toys of the 1950s and 1960s were to be seen, not touched. 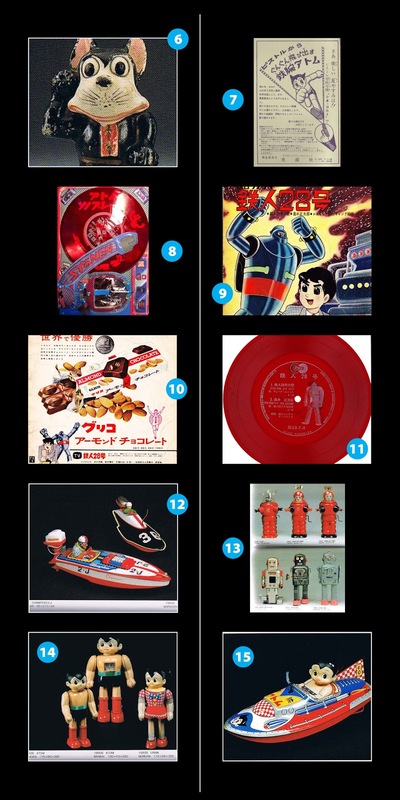 Here I relied on the formidable efforts of toy collectors like Kitahara Teruhisa (whose Omake no hakubutsushi is a real treasure trove of anecdotes and information), Takayama Toyoji and Tada Toshikatsu, all of whom have established museums, and published series of books collecting images of old toys. Visiting their museums, and studying the transformation of buriki tin toys from generic robots and automobiles of the 1950s and early 1960s (Figures 12 and 13) to character-based toys of the mid-1960s (Figures 14 and 15) was yet another way to get a sense of the transformations wrought by television animation on its surrounding media ecologies. Not only were characters increasingly integrated into the toys, but the very materials of the toys changed. Vinyl was introduced into the tin toy as a way of better capturing the rounded features of characters, leading to a hybrid tin-vinyl toy. This inclusion of vinyl proved to be an inkling of changes to come, with fully plastic character toys becoming the norm in the 1970s. These transformations in form and the very material used to create them were proof of the impact of the character image on realms that were – like the buriki tin toy of the ‘50s – previously immune to the circulation of the character image. This engagement with the form and material substrate of the toy also made me very sensitive to other kinds of toy experiments taking place in the present day. I’m thinking here of the explosion of so-called designer toys, art toys, or urban vinyl. Marc Steinberg is author of Anime's Media Mix and assistant professor of film studies at Concordia University. "Anime’s Media Mix is a must-read for anyone interested in the transformations of contemporary media. In portraying how anime characters are emblematic of mobility and connectivity in a broader media ecology, Marc Steinberg maps a new logic of production and consumption that shapes our world today." "Marc Steinberg opens up brave new possibilities for the study of global media cultures. Attending to the watershed years of Japan’s 1960s and the ascendance of televisual animation he details how entire commodity regimes came to circulate around the idea of the anime “character.” Original and timely, historically dense and theoretically acute, Anime’s Media Mix definitively teaches us that anime can no longer be thought outside the networks of its transmediation."